In their most dramatic, ambitious, and significant historical series to date, Bodie and Brock Thoene once again transport readers back in time to first century AD and the most critical events in the history of the world. In FOURTH DAWN, Herod, the king of Judea, plunges deeper into madness as people wonder, Where is the promised liberator? As signs appear in the heavens, Mary of Nazareth receives an unusual visitor. What he tells her will change everything about her life. . . and impact all those in Judea and beyond for eternity! - Publisher A.D. Chroniclestrade; Where is the promised liberatorwho will set the world right? No one is secure in Judea. Betrayal and suspicion are the coin of the realm as King Herod plunges deeper into madness, determined to hold on to his kingdom . . . no matter the price. Young Mary of Nazareth receives an unusual visitor as she tends a cow in her parents - A?A? barn. What he tells her will change everything about her life . . . and impact all those in Judea and beyond, for eternity! Yet will Yosef, her betrothed, believe her? Or will she lose the one she loves? Onias the Tutor puzzles over the ancient prophecies in secret. If anyone discovers what he knows, not only he, but his beloved wife and child, will be in imminent peril. Now signs are appearing in the heavens. But what do they mean? Special feature: Study questions suitable for individual use or group discussion. About "Fourth Dawn (#04 in A.d. Chronicles Series)"
A.D. Chroniclestrade; Where is the promised liberatorwho will set the world right? No one is secure in Judea. Betrayal and suspicion are the coin of the realm as King Herod plunges deeper into madness, determined to hold on to his kingdom . . . no matter the price. Young Mary of Nazareth receives an unusual visitor as she tends a cow in her parents - A?A? barn. What he tells her will change everything about her life . . . and impact all those in Judea and beyond, for eternity! Yet will Yosef, her betrothed, believe her? Or will she lose the one she loves? Onias the Tutor puzzles over the ancient prophecies in secret. If anyone discovers what he knows, not only he, but his beloved wife and child, will be in imminent peril. Now signs are appearing in the heavens. But what do they mean? Special feature: Study questions suitable for individual use or group discussion. 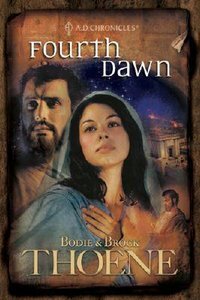 Customer Reviews For "Fourth Dawn (#04 in A.d. Chronicles Series)"
We don't tend to think much about Joseph, Mary's husband. This book in the series takes us through Joseph's life. It really brings him to life, the struggles he must have went through to protect Mary and The King of Kings. The Good Shepherd is rescuing lives across Israel... but is this hope for all or just for His flock? And why do so many leaders want Him dead? Zachai, chief tax collector of Jericho, is the most hated man in all of Judea. Outside the walls of his estate, he's surrounded by four giant Nubian bodyguards. But at night he's a prisoner of his aching heart. What would it be like to be loved? To have a family? Shimona, former leper from the Valley of Mak'ob, returns to her hometown of Jericho to proclaim that Yeshua has healed her. When no one believes her story, she is shunned and sent to live alone as the caretaker of a grove of sukomore fig trees. Month after month she holds on tightly to hope in the midst of her loneliness. A former prince among the Nubian tribes, Salmon was betrayed and sold into slavery. Now one of the few treasures he has - his little daughter Marisha - is dying. Salmon has heard stories of Yeshua's miracles. But would the Great Shepherd have mercy on a sheep that's outside Israel's flock? Each day Marisha grows weaker. Special feature: Study questions suitable for individual use or group discussion. Order now to secure your copy when our stock arrives. Other edition is available. 9780842375191 0 Available. Expected to ship in 4 to 5 weeks from Australia.